Politics, crafts, ecology, tradition and disruption at the Waterweavers show. Thanks to the advice of my dear Colombian friend Cristina Grajales, whose decorative arts gallery in New York is home to some of the artists below, I spent my morning at the Waterweavers show in the Espacio Cultural Conde Duque in Madrid, my brain and senses exploding from beauty, intellect and refinement overload. I would tell you to run to this show but sadly it closed this sunday. In any case I am sure that it will be coming to a city near you soon. It is impossible not to be moved by Waterweavers, a place where nature, arts & crafts and beauty have become the catalysts and maybe even the saviors of the humans that inhabit a troubling world that they have created, or not. Politics, crafts, ecology, tradition and disruption, it is all here in the Waterweavers in every form; an interactive and tactile show with video installations of bullets exploding in a river or a man eating grass, woven carpets of magical colors and textures, ceiling lamps made of plastic bottles, dyed tangled fibers hanging from the ceilings like lianas and huge bamboo armchairs to sit on. 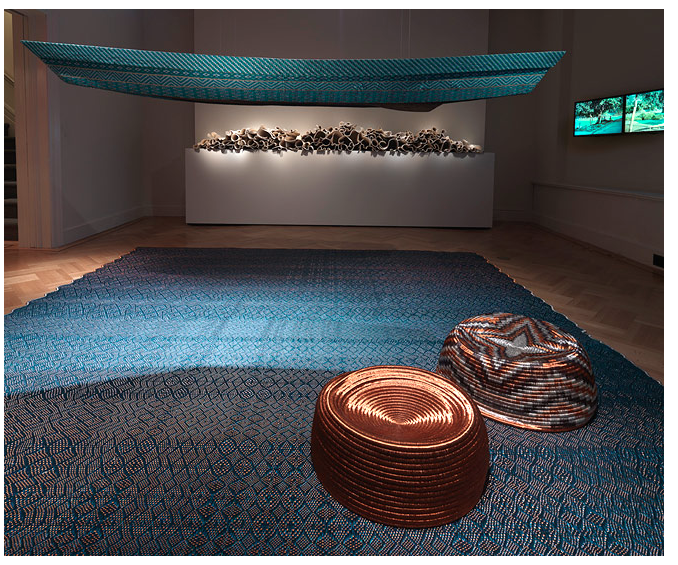 The confluence of the image of the river and the act of weaving is present both metaphorically and literally across contemporary practices in Colombia. Using the river as a conceptual device to explore the intersections in Colombian culture today between design, craft, and art, Waterweavers investigates the intricate ways in which culture and nature can intertwine across disciplines. 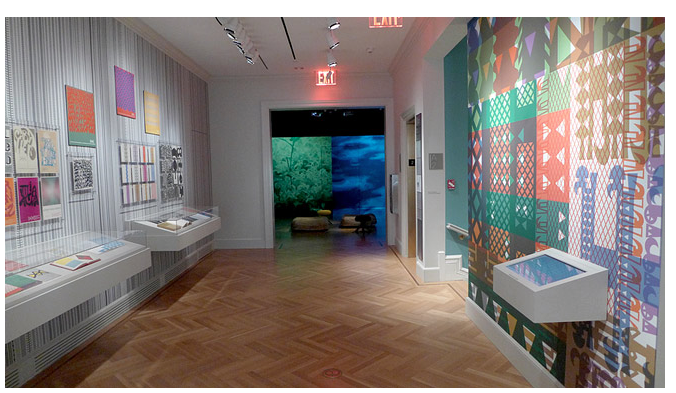 The Bard Graduate Center Gallery provides a backdrop for a series of displays that emerge from a curatorial strategy in which immersive environments presented on the walls frame three-dimensional pieces at the center of each room. 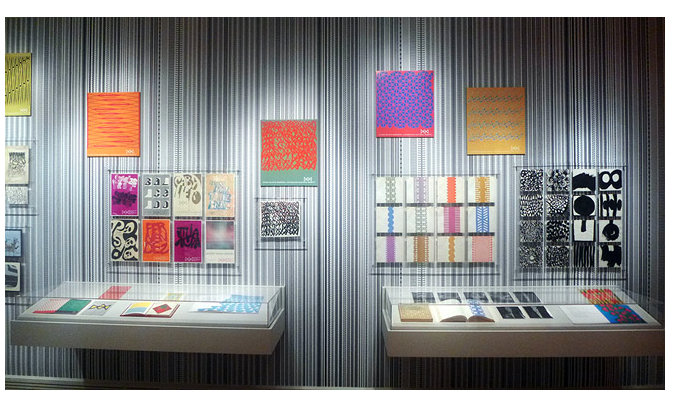 The exhibition includes drawing, ceramics, graphic design, furniture, textiles, video, and installations. Unexpected juxtapositions create a critical and conceptual friction between works and practices that are seldom shown together. Colombia is a country whose complex topography has historically caused waterways to be the only means of transportation between many communities—rivers have both united and separated people. Today, when most Colombians live in cities, rivers continue to serve as the sole access to remote areas, but they also play a new role, as the axis for a different type of economics: the black market fueling the armed conflict that has plagued Colombia for decades. Waterweavers addresses these issues from very different points of view, presenting a territory laden with conflict while showing the creative output that nevertheless thrives in the midst of—or in response to—hardship. Artists and designers included: Olga de Amaral, Susana Mejía, Alberto Baraya, Abel Rodríguez, David Consuegra, Tangrama, Monika Bravo, Ceci Arango, Clemencia Echeverri, Marcelo Villegas, Álvaro Catalán de Ocón, Lucy Salamanca, Jorge Lizarazo, Nicolás Consuegra, Carol Young. Below : Marcelo Villegas “Doble Curva chair” . Clemencia Echeverri “Treno” video . Photo credit Bruce White. 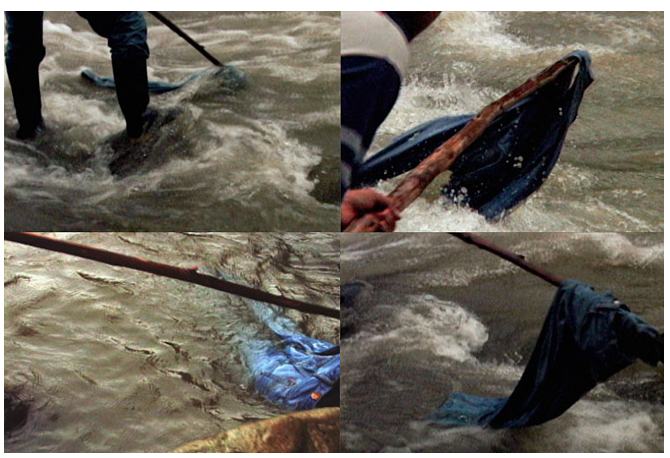 Clemencia Echeverri’s video installation Treno (2007) depicts the roaring, tumultuous Cauca River. The title of the work, an archaic Spanish word that means “funeral chant,” refers to mythical associations regarding the role of the river as the threshold between life and death and as the vessel for the last voyage. This metaphorical reference finds new meaning when one is confronted with the reality of the political situation in the Colombian countryside, where casualties of armed conflict are dumped in rivers such as the Cauca, thereby preventing relatives of the dead from knowing their fate. Below : Abel Rodriguez “Fish trap”. Photo credit Alejandro Martin. Fish trap. 2013 , woven yaré fiber and 12 drawings : Ciclo anual del bosque de la vega (Seasonal changes in the flooded rainforest). 2009-2010 . Ink and watercolor over digital print on paper. Below: Susana Mejia “Color Amazonia”. Photo credit Alejandro Martin. Color Amazonia is the result of seven years of ethnobotanical research on natural pigments in the Colombian Amazon rainforest conducted by an interdisciplinary team led by artist Susana Mejía. 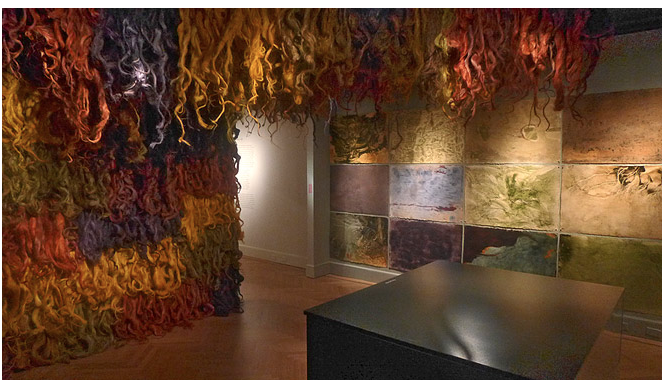 The installation consists of papers and fibers dyed with natural pigments and monotype prints made directly from plants. Tinted fibers from the fique plant, which is native to the Andean regions, hang from the ceiling, mimicking the way they were originally left to dry in the jungle. Color Amazonia introduces the theme of the natural environment of the Amazon River, particularly the plants that grow on its banks and the natural fibers and pigments that are used by communities alongside it. Alberto Baraya Rio video was filmed while he was documenting a naval patrol ship’s trip down the Amazon and Putumayo Rivers, presents the troubling world of contrasts that is the river environment of Colombia. 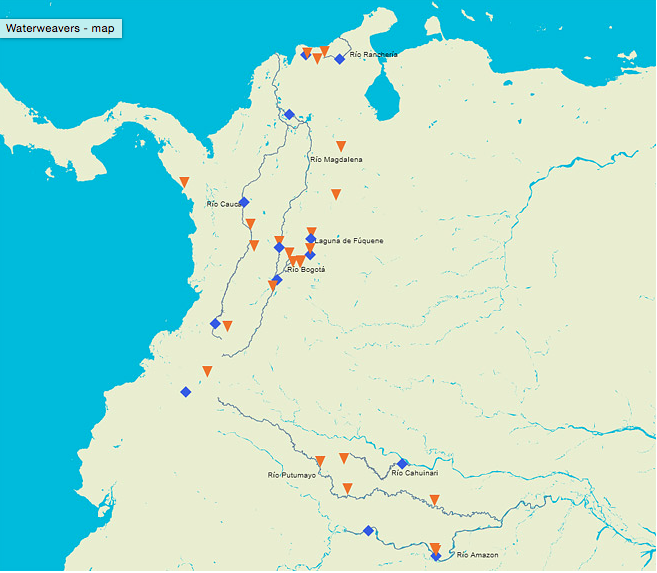 A work of great poetic and political resonance, Río depicts the massive rivers that serve as primary tributaries for drug trafficking, waterways that are home for the guerrilla groups that, in the absence of a strong state, control the turbulent outlying territories. 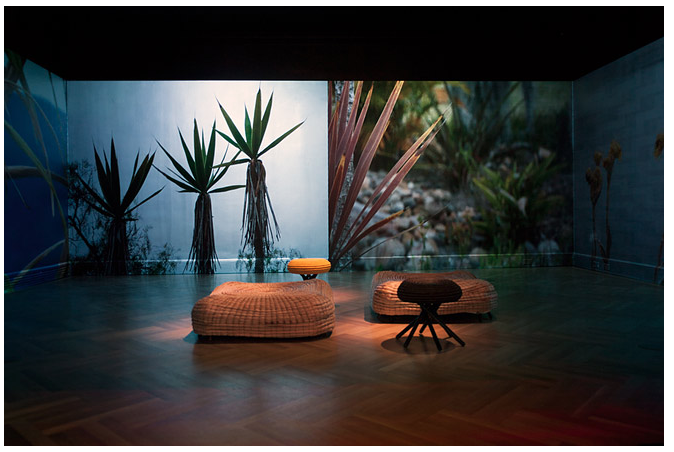 Below : Ceci Arango “Cococora stools” and “Cucarachero” poufs. Monika Bravo video”Urumu” . Photo credit Bruce White and Juan Luque. Cecil Arango: The seats are handwoven by women from the town of Guacamayas, Colombia, who are well known for a traditional spiral-basket-weaving technique whereby a core of esparto fibers is wrapped in fine fique threads. Visitors are encouraged to sit on the stools. 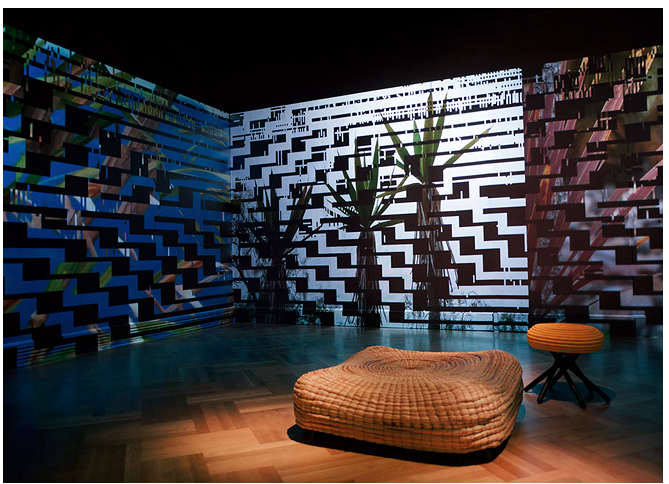 Monika Bravo: The video installation is inspired by a traditional pattern of the Arhuaco people, a cultural group native to the mountanious Sierra Nevada de Santa Marta region adjacent to the Caribbean coast of Colombia. Working from a mathematical analysis of the way in which Arhuaco women weave their patterns, Bravo replicates their designs by constructing the textile digitally, using pixels as her “threads.” Bravo’s digital weaving eventually morphs into the landscape of the Sierra Nevada. Below : David Consuegra. Photo credit Alejandro Martin. Drawings, illustrations, posters, magazines, brochures, and books, ca. 1960–83. In the late 1960s, David Consuegra, one of Colombia’s foremost graphic designers, conducted research on motifs in pre-Hispanic indigenous objects that resulted in a new graphic vocabulary with references to water, weaving, fauna, and flora. Below David Consuegra and Tangrama. Consuegra’s drawings, prints, and books are shown together with the work of Tangrama—a leading contemporary graphic design studio based in Bogotá that is the collective endeavor of artists Mónica Páez (* 1977 Bogotá), Margarita García (* 1978 Bogotá), and Nicolás Consuegra (David’s son, * 1976 Bogotá). For the exhibition, Tangrama has produced wallpaper designs and an interactive application based on David Consuegra’s pioneering research. 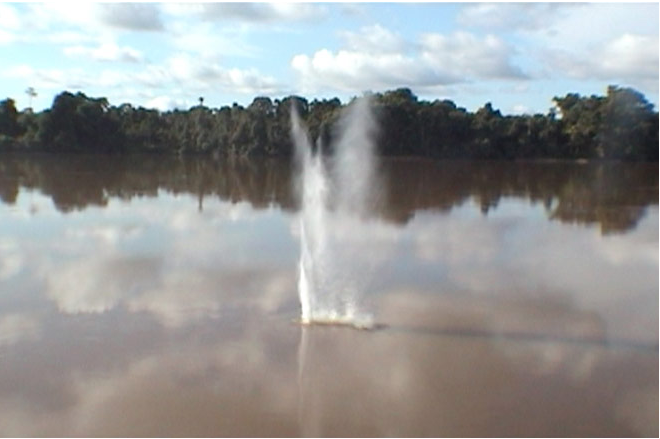 Below Alberto Baraya ” Arbol Historico” and Abel Rodriguez “Fish Trap” . Photo credit Bruce White. Hanging on opposite walls are two groups of “botanical plates.” Alberto Baraya gathers artificial flowers and plants from all over the world and then classifies them in the manner of a botanist. His most recent collecting “expedition” was conducted in New York. 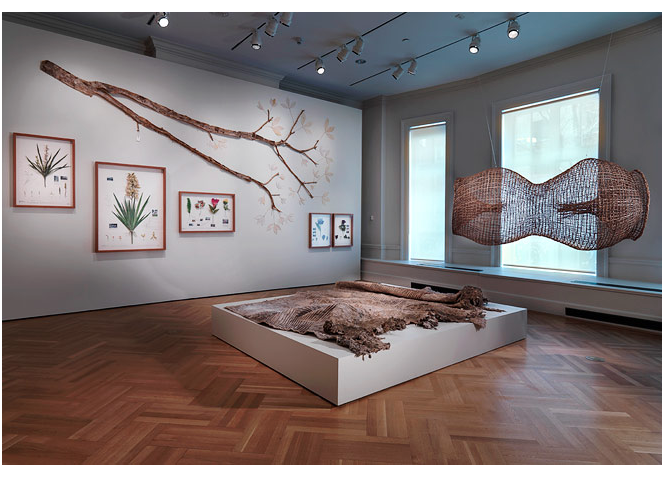 Abel Rodriguez, a member of the Nonuya people of the Caquetá River region, produced meticulously detailed drawings in collaboration with Tropenbos International, a Dutch NGO concerned with the preservation of tropical ecosystems worldwide. 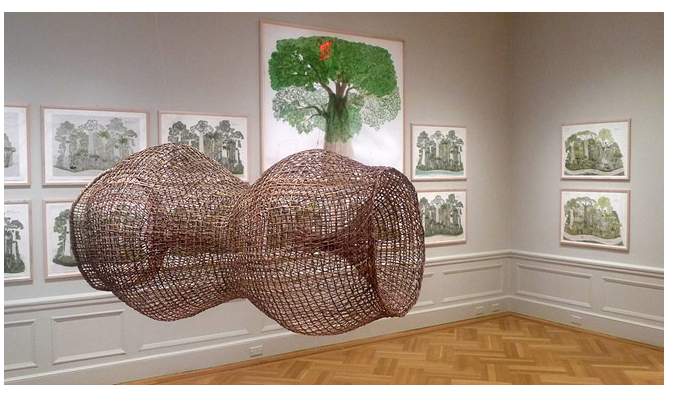 His series depicts the monthly cycle of the flooded rainforest, and the large drawing features a tree—a symbol of the origin of life for many Amazonian peoples. The two works in the center suggest contrasting interpretations of nature. Rodríguez’s “fish trap,”captures the beauty of natural materials and evokes the functional logic of a traditional form. Baraya’s shroud-like latex cast of a tree historically tapped for rubber, made in the Amazon with the aid of former rubber tappers, conveys how the relentless search for natural resources has ravaged the country’s landscape. The tree’s scars impressed upon the latex cast recall a textile design and also suggest the scars left on Colombia’s social fabric after decades of exploitation during the rubber booms of the late-nineteenth century and the World War II era. Below: Alvaro Catalan de Ocon ” PET Lamp Project” , Lucy Salamanca “Out of Balance” stools. Photo credit Alejandro Martin and Bruce White. 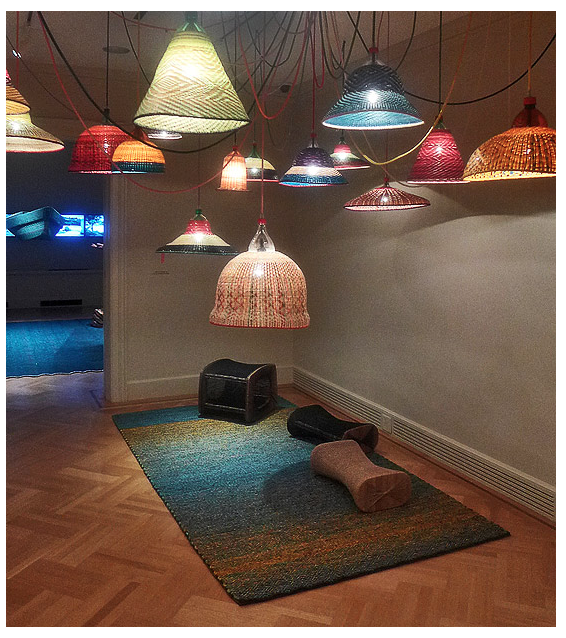 A group of lamps from the PET Lamp (2013) project hang from the ceiling of this space. PET Lamp grew out of an initiative of Spanish designer Alvaro Catalán de Ocón, who was invited to Colombia to provide a model for recycling the plastic bottles that pollute rivers worldwide. 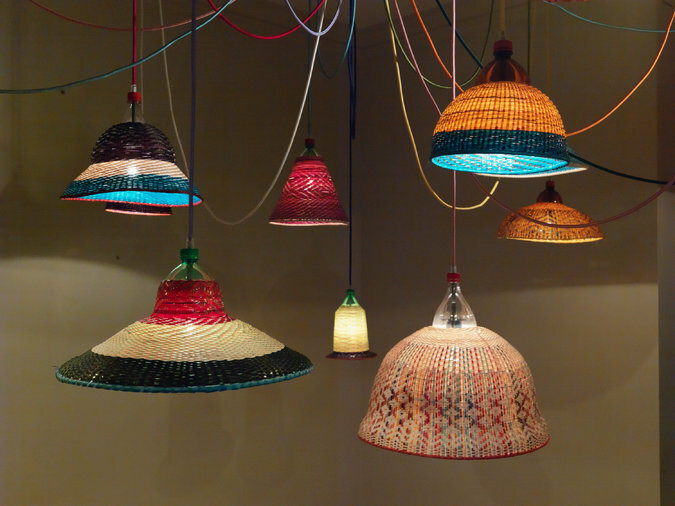 Relying on weaving techniques and patterns traditionally used by the indigenous Guambiano and Eperara Siapidara communities to create baskets and textiles, Catalán devised a system whereby discarded bottles are slit vertically and the resulting threads are woven into unique lamps, extending the use cycle of these ubiquitous objects by linking them to tradition. Lucy Salamanca is a Colombian designer based in Italy whose involvement in several rural communities in Colombia has helped to preserve and develop local craft techniques. 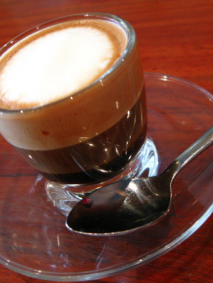 Working worldwide for fair trade and sustainable design, Salamanca is committed to promoting ethical pricing, wages, and environmental practices. Below: Jorge Lizarazo/Hechizoo. 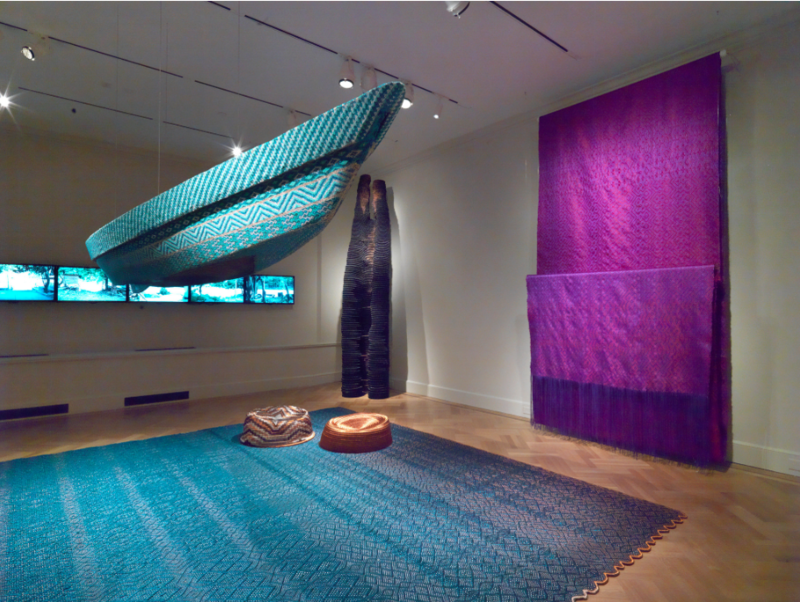 “Walking Jade” rug area, “Wouna and Woun” stools , “Jade Textile” wall and wood carved canoe.Photo credit Bruce White. 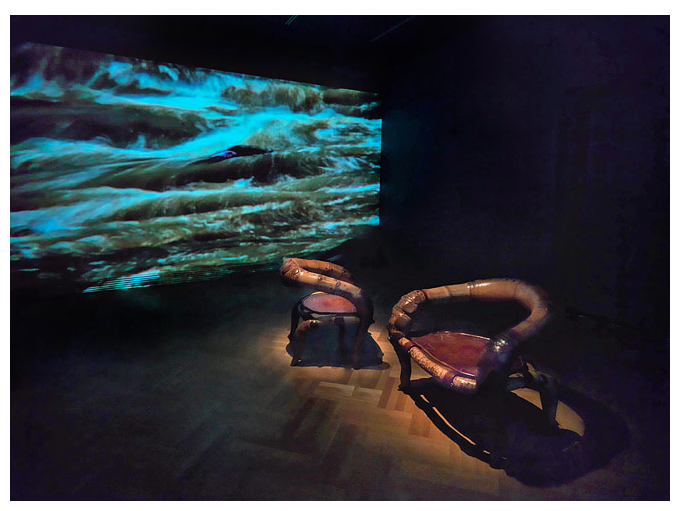 Nicolás Consuegra’s video installation “El agua que tocas es la última que ha pasado y la primera que viene”. Carol Young sculture “Memoria”. 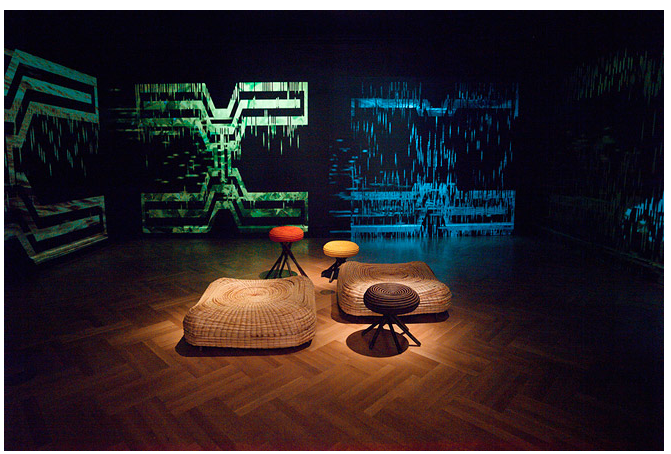 Jorge Lizarazo, who founded the workshop Hechizoo in Bogotá in 2000, seeks to reinterpret indigenous Colombian weaving methods, materials, and techniques. Lizarazo has established himself as one of the foremost creators of contemporary textiles, deftly incorporating tradition and modernity into his work. The installation consists of textiles, rugs, and a freestanding rubber and copper tree, along with a canoe from the Putumayo region that hangs from the ceiling and is clad with glass beads. For more information on all the works and artists in the show, go to two excellent articles on the Waterweavers show : The New York Times and Universes in Universe, whose detailed material I used for this post. The beautiful catalog of the show is available here. Beautiful post!! Me encanta, gracias por dar a conocer este tipo de proyectos. Yo tambien quiero una Pet Lamp!! En Marruecos los pescadores hacen lamparas con paja trenzada, las vi cuando Sylvia me llevo a la tienda en Tanger donde vuestra madre compraba las sillas para el jardin. J’etais sure que tu aurais aimé ! 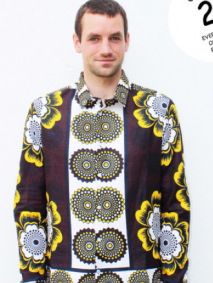 c’est ton truc….tu comprends tout. 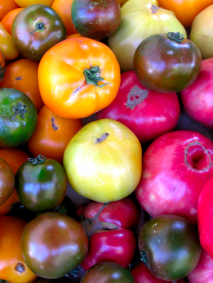 Heirloom tomatoes & gazpacho time.